Black Heart – this is my first try at hand-painting yarn. I’m ecstatic about the colours, but the process was a little time-consuming, as I had to dye twice after the first round left too many white patches. I found out that it’s much simpler to set the dyes in the microwave than by steaming on the stovetop (this was discovered after I scorched the bottom of my dye-pot when all the water boiled off). I have 3 more skeins of the base yarn, which is knitpicks ‘bare’ merino / nylon sock yarn. I haven’t knit with it before, so I’m hoping it’s decent – and if I feel like it won’t stand up to hard wear as socks, I may knit a hat or scarf with it. OR… gloves for me? 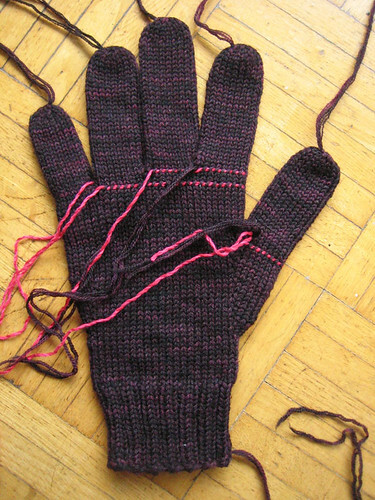 But of course, despite the downsides, I’m going to have to knit myself a pair as soon as his are off the needles, because it’s still cold and crisp here in Vancouver, and fingerless gloves are really a joke when it comes to keeping you warm!! Lastly, I made a second purchase at Urban Yarns, and it is none other than the lovely malabrigo merino lace, a buttery soft and brilliantly dyed single-ply lace yarn. 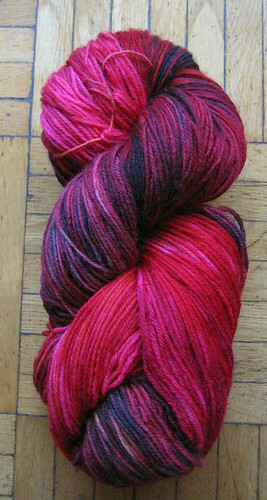 I have lusted after this yarn for SO LONG, and finally have it in my clutches!! The swatch shows the stitch pattern I’m using to create a fat scarf / stole. It’s a pretty brainless stitch pattern, so it’ll even be suitable for knit nights, and watching TV. Your handpainted wool is beautiful! I would love to give it a try sometime. I don’t see the pattern for the lace that you show here. Can you tell me where I can find it? It looks intriguing! Great projects! I love the yarn you died and know it will be beautiful when you knit it up. And the lace looks so great! 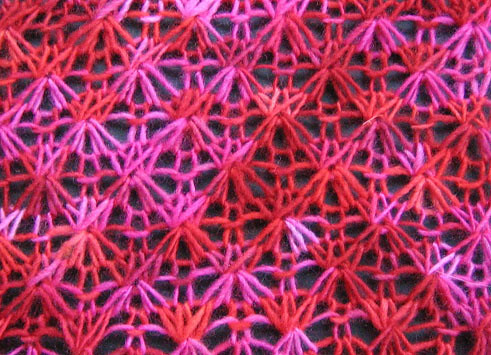 What a cool stitch pattern!